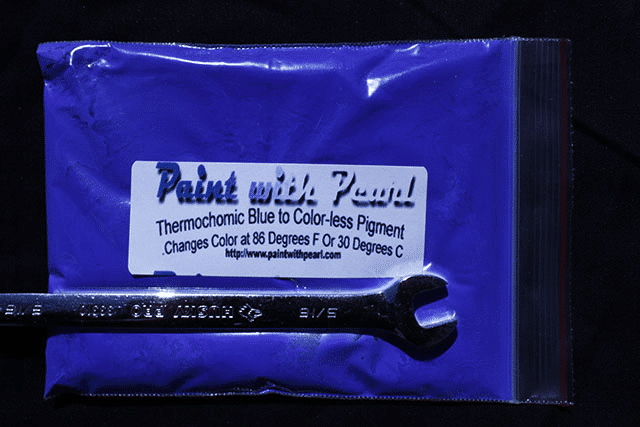 Try Our Blue Thermochromic Heat Sensitive Pigment. Changes from Blue to Colorless as the temperature rises past 86ºF. Other temperatures may be available on request. Make sure to understand the U.V. tolerance of this product before buying. Blue Thermochromic Paint Pigment. Changes color with Temperature! 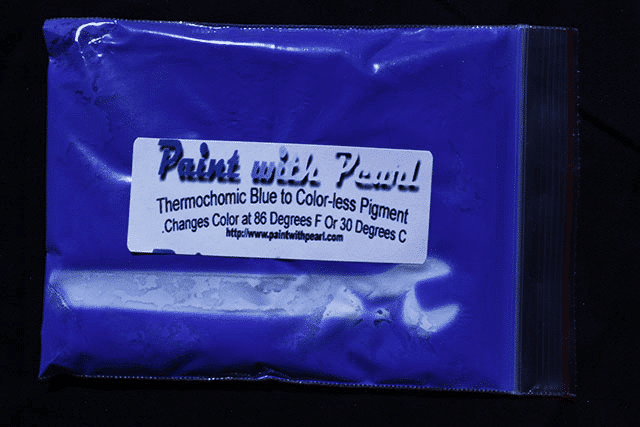 This 25 gram Blue Thermochromic Paint powder is a great heat sensitive pigment for Custom Paint! It is called thermochromic pigment. You can now create dazzling effects that change color when the temperature of the item changes. This Blue Thermochromic Paint is being used in everything from toys to choppers to home interiors. Many are experimenting with it to create the ultimate home efficient roofing, because it could literally change from blue to white when the temperature was hot. Mix into any clear base coat (like a binder or color blender), and spray over your desired graphics or base coat color. 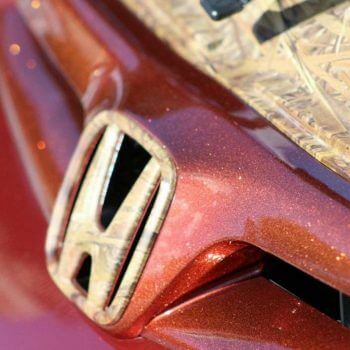 See our article, How To Mix Custom Paint. As mentioned in our article about temperature change paint, this product requires a great deal of UV protection in order to create a lasting effect in outdoor environments. We recommend a highly UV protective clear for outdoor or exterior use. Because this paint is dependent on UV protection, we offer no warrantee on it’s longevity, since that depends on how you topcoat it. Tip: using this Blue Thermochromic paint underneath Ghost Pearls ® or Chameleon Pearls ® will help increase it’s tolerance to UV rays as well, as pearls are made with titanium oxide, a principle ingredient in sunscreen protectants. Thermochromic pigments change color dramatically (even from black to white) as the temperature changes. Ours are set to change at 86 degrees F. This Blue Thermochromic Paint pigment can be used in everything from custom paint to clothing. Our pigments have been used in everything from masks to motorcycles. Use in your own testing for a custom application! Thermochromic paints change as the temperature changes. As the temperature goes up, the pigment becomes colorless, revealing the base coat or graphics underneath. 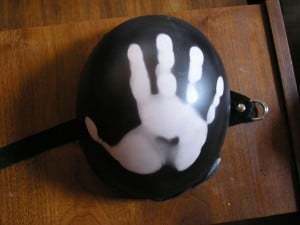 The helmet shown was a white base with a black temperature sensitive paint sprayed over it. The following video is causing a huge increase in our product sales for themochromic pigments. 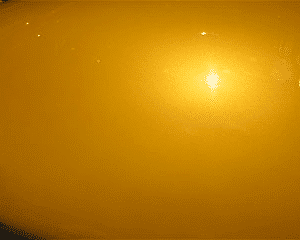 What you are looking at is Black THERMOCHROMIC OVER an orange base. The second video (right) shows how body heat can effect thermochromics in an amusing way… See Above Videos. We recommend starting with 1 25 gram bag per quart of sprayable clear paint/binder. These starting ratios are adjusted for your specific use. This product mixes into 1 25 gram bag into a pint of reducer. It should sit for 24 hours before mixing with one pint of clear paint to make a sprayable quart of material. This goes best into an oil or solvent based clear. Mixing with a water based clear has not caused us any issues but other customers have had difficulties. Contact us with any questions before mixing. This pigment is highly UV intolerant. Do not use it on anything exposed to UV for any period of time. There is no guarantee on the life of this paint due to the UV and heat factors. There are too many variables that make it difficult to guarantee the life of this product. Our Blue Thermochromic Paint Pigment is very popular and is great for experiments, and has it’s place as one of the coolest pigments out there.